Vacation rental . Sleeps 5, 0 bedroom, 1 bathroom. No pets allowed. 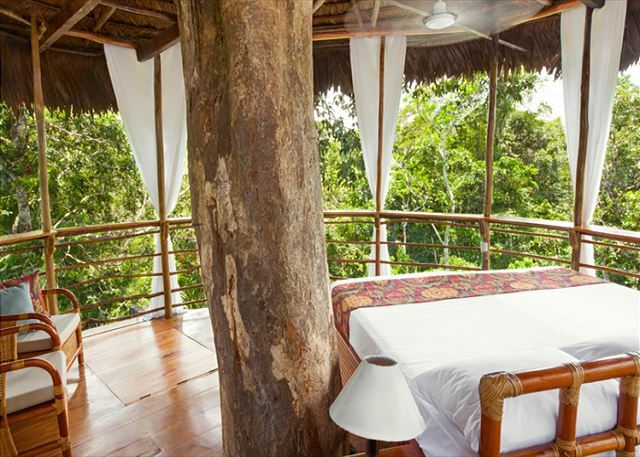 All bungalows at Treehouse Lodge come with comforts you wouldn’t expect to find high in the trees in the middle of the jungle. Showers, sinks, toilets, fresh white linens, comfortable beds, and chairs are our standard. So they don’t come with hot water, but a cool shower after spending the day in the heat is very refreshing. The entire structure of the bungalow is sealed by mosquito mesh woven so fine that it will not obstruct your view in any way. Additionally, each bed is equipped with another layer of mosquito mesh drapings which tuck in under the mattress. The friendly staff at Treehouse will take your luggage to and from your bungalow and clean your bungalow daily. After enjoying a nice dinner at the main lodge, the path to your bungalow will be lit ensuring you a peaceful and safe walk home for the night. Casa Grande is the largest bungalow at Treehouse. 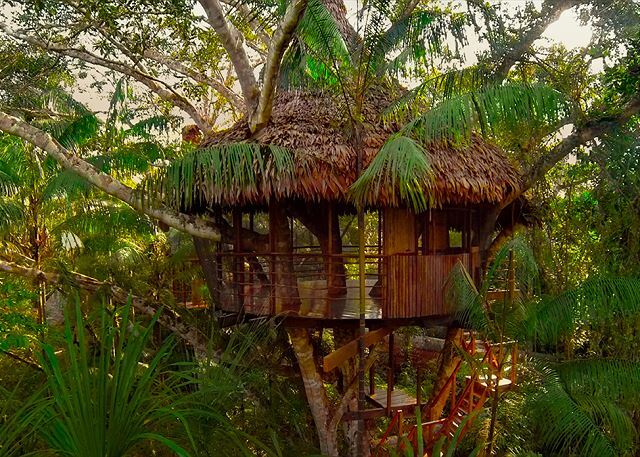 It looks and feels like the charming home fit for the Swiss Family Robinson. It sits 25 feet off the ground and spans approximately 22 feet in diameter. 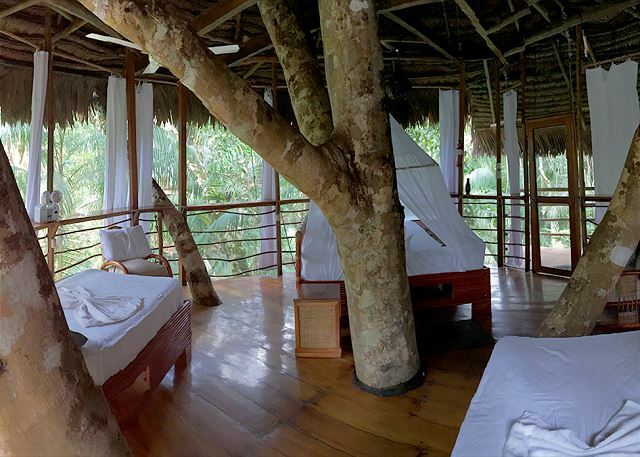 A few large branches within your bungalow make you really feel like you’re truly living in a treehouse! And the views will have you mesmerized. It can be arranged with either one king bed and one twin or three twins. Also, 1 - 2 portable cots can be provided if requested for additional people. We had the most INCREDIBLE time at our treehouses. I couldn't recommend this place enough to anyone who is looking for an adventure and a once in a lifetime experience! Our stay at the Treehouse Lodge turned out way above our expectation! From the get go, the reservation team was very professional: processing the reservation, addressing our concerns and provided a very detailed email with clear pick-up instruction for our arrival. The Kitchen team was extremely friendly, went out their way to provide really delicious food, pleasant ambiance. 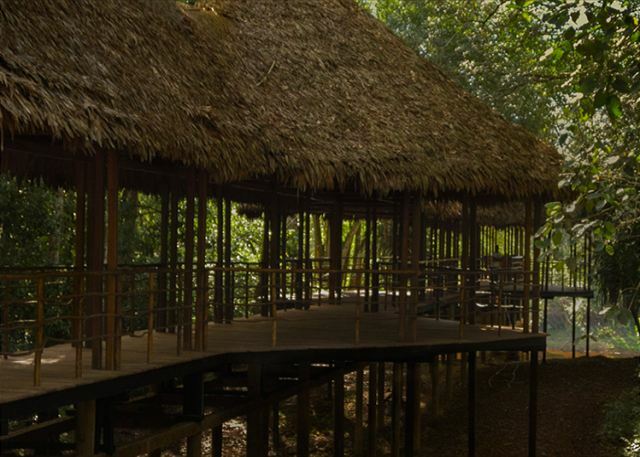 The activities provided a true Amazonian experience. This place is beautiful. My husband and I stayed in Treehouse 4. 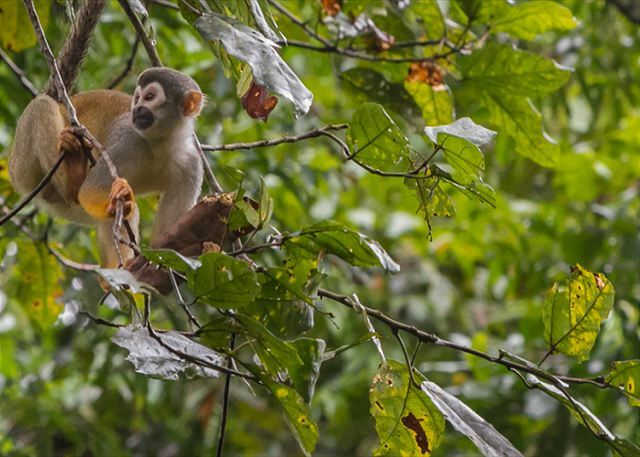 We watched squirrel monkeys in the trees and listened to all the wildlife at night. It was a wonderful experience. The room was cleaned daily and the bed was comfortable. The cold showers are welcoming with the warm, humid weather. Plenty of excursions to keep you out exploring the area. We spotted pink dolphins in the river out front of the lodge and a lot of other wild life. The guides are all very friendly and knowledgeable. We witnessed one of the most beautiful sunsets on the Amazon cruise we have ever seen and swam in the river. The food was decent. I am a vegan and the chef made some fantastic meals. All the other staff was very friendly. This was a great place to visit. It is worth the trip down there. We really enjoyed staying at Treehouse Lodge! The staff were all so friendly, welcoming, and knowledgeable. Pepe was an awesome guide! We saw so much while we were there- dolphins, monkeys, caiman, sloths, birds, and more. The rainforest is beautiful! Pepe shared so much of his knowledge about the culture, animals, plants, river, and more! ! 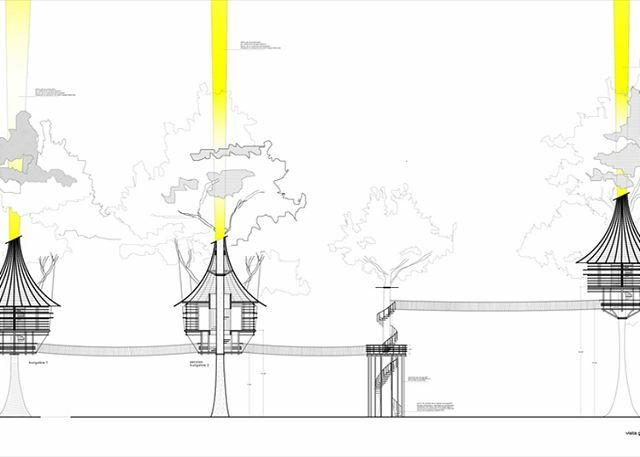 The treehouse was very nice. We slept wonderfully to the symphony of the rainforest. The food was delicious and Martin (bartender and server) was so helpful and kind. 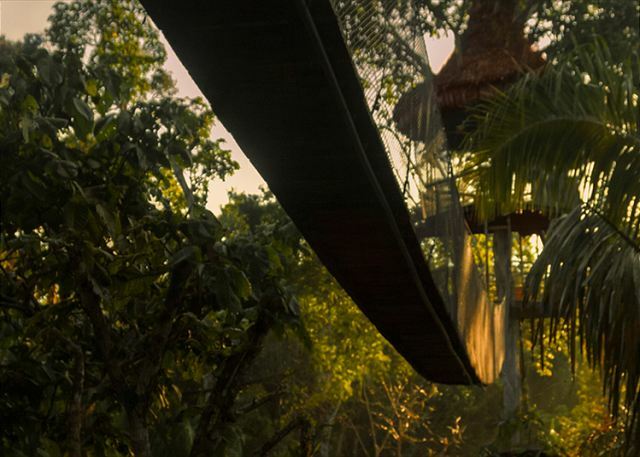 We would most definitely recommend that you stay at Treehouse Lodge! Trip of a lifetime! We had an amazing time much due to our knowledgeable and friendly guide Johny and his experienced boatman Roger. we were met at the airport at the start of our holiday and returned to our hotel in Iquitos afterwards. 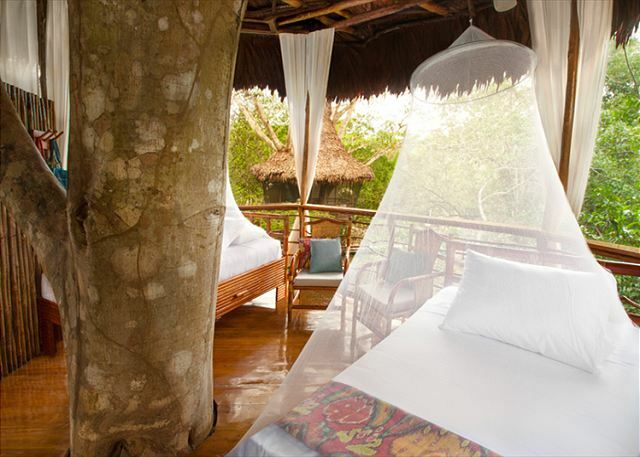 The Treehouse was clean and comfortable - a unique experience being up in the treetops! The food was gourmet and carefully explained by our waiter whose service was impeccable. We enjoyed the fact that everything was included in the pre-paid price and Johnny was flexible in our boat trips so that we saw everything and more than we hoped and his knowledge of the birds, beasts and environment was exceptional with very good english. We would highly recommend this unique trip. From the moment you arrive in Iquitos, customer service abounds. I highly recommend this experience to anyone. It is an adventure we will never forget and a customer service is Number 1. My son (14) and I had a great time at the Treehouse Lodge. Deep enought into the forest, very nice cabins/rooms at the top of 30-35 meters tall trees, and plenty of activities to do. Several opportunities to see free monkeys, sloths, macaws, several birds, and even go fishing some piranhas. Good service and simple but healthy food. Very good guides attending you in all activities, and all the way from the airport back and forth. Great time in the Amazon! We had a wonderful adventure in the Amazon courtesy of the Treehouse Lodge and Carlos and Hugo, our guides. The food and hospitality provided by the Treehouse staff were fantastic. We were fortunate to have dry weather during our 3 night stay. 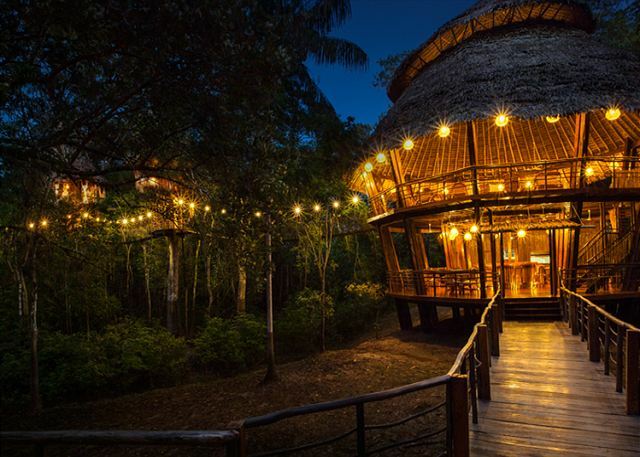 As long as you are prepared for the the experience of the Amazon, the Treehouse is an excellent place to launch your adventure from. Carlos and Hugo, in particular, provided such a great experience for us Minnesotans in the Amazon. Caimans, Macaws, Toucans, Piranha, Pink Dolphins, BUGS, was an awesome time for my family and I. Thanks to the Treehouse, Carlos, and Hugo for a great time! We stayed in Treehouse 4, which is the largest treehouse. It was the trip of a lifetime. We saw monkeys, sloths, dolphins, piranhas, and all kinds of birds and other flora and fauna. 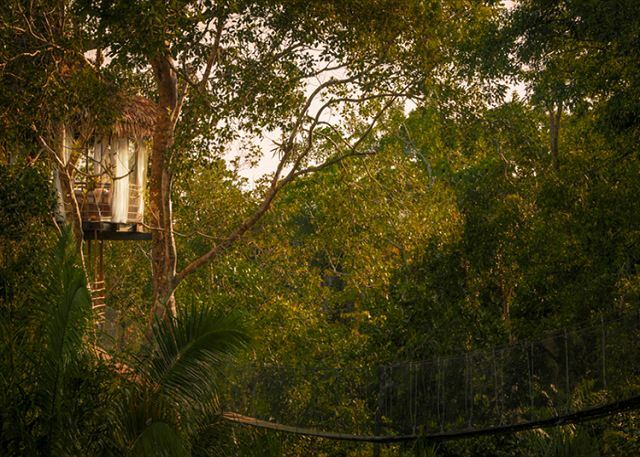 The view from the treehouse was truly unique and gave us a different perspective on the Amazon jungle. 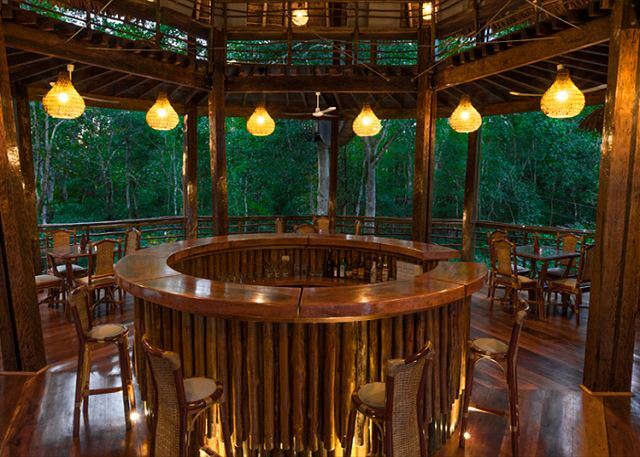 I can't imagine staying anywhere else during our time in the rainforest.